Alma's Alex Roberts’ casual meat-and-three celebrates our Southern American heritage. : A former service station is now home to some of the tastiest comfort food in Twin Cities. Leaving his upscale side behind, Alex Roberts, chef-owner of nearby Alma, takes a stab at home cooking, and we're lovin' the results. This is slow cooking utilizing the very best of local farm-raised, regional ingredients; suppliers are celebrated. Minnesota-raised pork is slow-marinated in peppers and tomatoes while the standout crisp-skinned chicken is sold in sandwiches or by the plate. 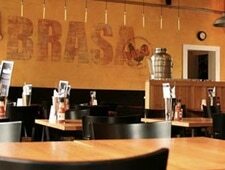 A bring-the-family spot, Brasa also specializes in a dozen or so Southern- and Caribbean-inspired side dishes, including yams with spicy andouille sausage, rice with pigeon peas, fried yuca, pickled cauliflower, crème fraîche-drizzled collard greens and a citrus-burst cabbage salad. Do not miss the corn muffins, pocked with sweet corn kernels, and the simple slices of white cake topped with buttercream frosting, a birthday-every-day treat. The downside: no reservations, which can translate into a long wait for one of just about 50 seats. Luckily, Brasa does to-go very well.